This year it will be 40 years since Britain got its first female rabbi, Jackie Tabick. And to date, Laura Janner-Klausner is the country’s only Jewish female head of faith, as the senior rabbi of Reform Judaism. But both women are from the Progressive wing of Judaism. It seemed that there was no place within Orthodox Judaism for educated Jewish women to become religious leaders. That may be all set to change, and it has a particular resonance as the Church of England welcomes Libby Lane, its first female bishop. 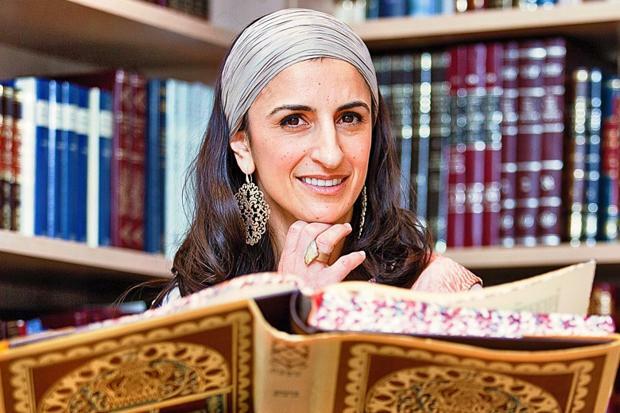 Dina Brawer is set to become Britain’s first Orthodox woman receiving rabbinical ordination, from an American study centre specifically launched for the purpose. The Yeshivat Maharat — a religious seminary for female leaders — in New York is already sending out its first graduates to work with congregations across the United States. There is, though, no particular dress code for the female Orthodox rabbis graduating from Yeshivat Maharat. “What’s important is what a rabbi does, not how he or she looks,” Brawer insists. Currently she is running a revolutionary (in Orthodox terms) series of workshops for brides and grooms together to teach about sexuality. “I had taught brides before their weddings for many years but then I did an intensive course, partly sponsored by Yeshivat Maharat — we wanted to find ways of teaching couples together. We found that often men and women were being taught different things.” Her workshops attract young couples who have been living together but who are eager to learn what Orthodox Judaism brings to marriage. Brawer, who has a BA in Jewish studies and holds a master’s degree in psychology and education from the Institute of Education, describes herself as a full-time student. Two years ago, however, she became Britain’s first ambassador for JOFA, the Jewish Orthodox Feminist Alliance, which was founded in America; Brawer set up its British wing. She works hard at what she describes as “grassroots activism, enabling people to think differently about how Judaism could work”. Often this involves teaching in community homes or holding seminars. Sometimes she is approached by Orthodox women who ask her to devise “life-cycle” events such as a batmitzvah service — the equivalent for girls of a boy’s barmitzvah or coming-of-age ceremony — or a “simchat bat” (welcome celebration of a girl) ceremony for newborn girls. There are plenty of such ceremonies in Progressive Judaism, but relatively few in the Orthodox world, although this is changing. Although within Britain’s (Orthodox) United Synagogue, women have begun to be employed in a variety of roles, there is no specific programme for training female religious leaders. Ironically, all too often Orthodox Jewish women have suffered precisely because of the Progressive trailblazers such as Rabbi Tabick and Rabbi Janner-Klausner, with every bid for equality in the Orthodox world dismissed as “aping Reform”. She lives in Hertfordshire with her family, studying remotely, with a couple of visits to New York every year of her four-year degree. She will qualify in 2018 with exactly the same skills that lead to rabbinical ordination for men. It’s too easy for religious authorities to dismiss women’s aspirations if the women are not well-informed. Brawer aims to change all that, by helping to create a core of Jewish women who are knowledgeable about their own faith. Did I always want to be a Rabbi? The answer is no. It never occurred to me. Growing up I already had a defined, robust role for me to serve my community as a woman. As a Chabad teen, I aspired to be a shlucha, a role that provided a clear path to spiritual leadership – regardless of marital status. As a result, I took up numerous communal responsibilities – from teaching to coordinating a Lag B’Omer parade to designing interactive educational exhibitions – all of them enjoyable and fulfilling. When I later married a rabbi, my position as a shlucha remained unchanged, as did my desire to serve my community. The reason the role of shlucha was so effective in enabling me to serve, therefore, was because it was understood, defined, and clearly labeled. After five years on shlichut, my husband and I moved to the UK where he took up a position as a congregational rabbi. Over the next fifteen years we served two London congregations. As a Rebbetzin, I led community development strategy, counseled congregants, taught Torah – and baked plenty of challah. And yet, while I clearly had carved out a communal role for myself, I couldn’t avoid the nagging feeling that if it weren’t for my husband, I wouldn’t have that role. I felt this most acutely when at events outside the Jewish community. People asked us what we did. My husband replied that he was a rabbi. But what was I? What could I say? A rebbetzin? A rabbi’s wife? That would just beg the question – what exactly does a rabbi’s wife do? My husband’s title could capture, in one word, who he was, whereas I had to spend fifteen minutes explaining what exactly I did. The sense of not having a leadership role in my own right was driven home quite forcefully, when an invitation arrived to join communal leaders for the launch of an important report concerning the role of women in the Jewish community. It was addressed solely to Rabbi Brawer. The title of Rebbetzin evidently did not mark me out as a leader; it merely indicated that I had married a rabbi. I am not being dismissive of the important and varied work many Rebbetzins do for their congregations. Rabbinic spouses should be recognized, appreciate and respected. But the “two for one” deal – the status quo in many Orthodox communities – is as detrimental as it is prevalent. The widespread expectation that rabbis’ wives will assume the role of rebbetzin very often burdens women who choose to pursue their own careers. By the same token, hiring rabbis based on the expected role their wives will play unfairly disadvantages able leaders with much to offer. Simply put, our communities deserve the best leaders: the best male leaders, irrespective of their wives; the best female leaders, irrespective of their husbands. What message does a community convey when the role of female leader is limited to women who happen to be married to a rabbi? It is insulting to women’s intellectual and pastoral capabilities. It also severely limits the pool of potential leaders to spouses of rabbis. Moreover, since the title rebbetzin is not earned, but rather conferred on anyone who happens to be married to a rabbi, it has become essentially meaningless, by not distinguishing between those who are Torah scholars and actively engaged in serving their communities, and those who are not. Some communities have recognized the value of clearly defined female leadership, appointing women as community scholars, who in addition to teaching Torah and counseling congregants, facilitate life cycle events, and address the congregation from the pulpit. These women are occupying roles that extend far beyond the remit of the traditional rebbetzin, and the congregations who hire them should be commended for their vision. However, whilst these women are highly proficient in Torah study, there is no uniform standard to their training, and a dearth of courses designed specifically for their leadership. Furthermore, the lack of a defined qualifying designation means that these highly capable and dedicated women are still at a disadvantage, being denied the authority and influence, as well as the recognition, which comes with a bona-fide rabbinic title. For me, still seeking the defined leadership role I had as a young shlucha, Yeshivat Maharat offers a solution. In creating a formal qualification to deliver the skills required for women in the clergy, Yeshivat Maharat has opened a space, in which able women can truly be heard as leaders within the Jewish community. Crucially, it grants institutional semikha, conferring on women the authority to make halakhic decisions for their congregations. Personally, it has given me the opportunity to better serve my people by further developing my pastoral skills, broadening my leadership vision, and deepening my understanding of Halakha. Yeshivat Maharat is an exciting and positive development within Orthodox Judaism, and it is something that we should all celebrate and support.